Gretna Green Coach Museum a Rare Collection of 19th Century Coaches. 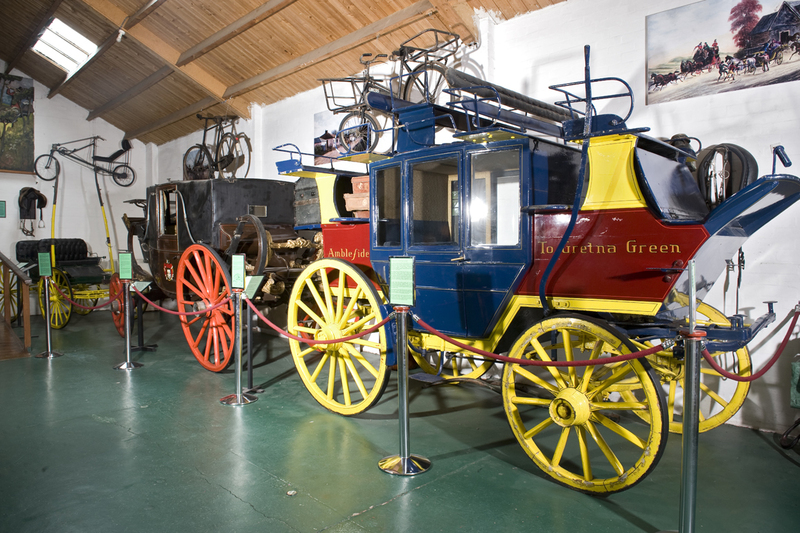 Visit the Coach Museum, which is part of the Gretna Green Story. Here a rare collection of 19th Century coaches, as well as other historic modes of transport are displayed, perhaps even those used by couples eloping to Gretna Green! View a magnificent royal carriage - known as The State Landau - used by King William IV and Queen Adelaide (aunt of Queen Victoria), on state occasions, and a stagecoach used on runs between the Lake District and Gretna Green. Wonder at the exquisite workmanship that has gone in to create these magnificent vehicles. This colourful collection has been admired by many and used as a backdrop to wedding photographs too! Also within the Coach Museum are various tools and artefacts used by tradesmen and farmers during the hey-day of the blacksmith. Visit Gretna Green just off the M74 motorway before Carlisle and have a great day out with the family, visiting our famous blacksmiths shop, and learn all about the history of Gretna Green. Also take the time to take a walk around our fantastic range of shops and places to eat such as our wonderful Foodhall and Blacksmiths Foodcourt rather than stop at the Gretna motorway service station.